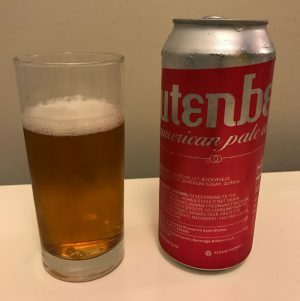 Glutenberg calls this beer “the true flagship of Glutenberg Beers”, and after tasting it I can see why. 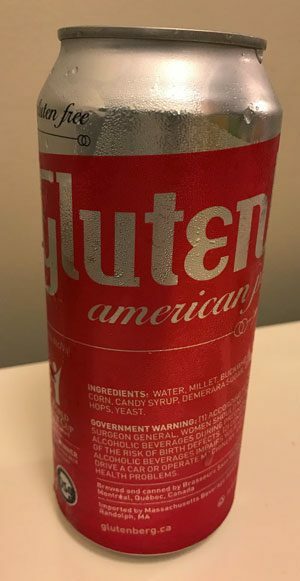 If you are looking for a good gluten-free American Pale ale (APA), look no further. Glutenberg has some strong beer offerings, including the 2016 Gold medal winning India Pale Ale. So when They call this beer their flagship, that is definitely something to consider. The challange with an good Amercian Pale Ale is to make it Hoppy enough to satisfy the “Hop Heads” out there, but also well-balanced enough so others will enjoy it as well. In my opinion, the over-the-top Hopped beer drinkers go right for the India Pale Ales, where all of their hopp-cravings are satisfied. I’m going to put muyself out there by saying that this APA will satisfy both audiences; It has plenty of Hops, but it’s well-balanced and finishes without the bitter taste of an IPA. Look – reddish orange with a one-finger lacy off-white head. Smell – citrus-orange, earthy hops. Body – full-bodied with medium carbonation and a little sharp, dry finish. Taste -caramel with grapefruit and apricot, a hint of sweetness and a smooth finish. Overall – hoppy, but well balanced and a smooth finish makes this beer tasty and drinkable. Tasty and balanced American Pale Ale. Just hoppy enough to satisfy, with being overwhelming.